Seniors may be allocated 18-25 hours of work each week with an expectation of them completing it. From experience, one would know the rest of their time is unplanned interruptions and helping others etc. Juniors may be given 30+ hours but still allowed a contingency for impromptu discussions, interruptions and miscellaneous time like coffee breaks. Work items were implemented into Abtrac as a result of users saying “look it’s great knowing what happened last week and last month but we need to know what’s happening next week and next month”. So as a time management system, Abtrac switched to manage forward time as well as current time and time already spent. Configuring Abtrac to Use Work Items. There are a couple of simple steps to take before you can use Work Items. Every work item has what we call a ‘State’. These indicate the status of the item. Examples would be New, In Progress, Completed, Cancelled, or On Hold. Some states are of interest i.e. they still need to be actioned and managed. Other states indicate the item has been done or in some other way dropped off the radar and doesn’t need to be kept in uppermost view any more. 2. The second thing you may want to do is review the Administration >> Settings >> User Control Settings for “Planned time >> Work Scheduling” and “Project Work Items” (which maybe Job Work Items in your list of User Control Settings. This can be done at any time, even after you’ve started using Work Items in earnest. Each job can have multiple Work Items. As above, these are ‘things to do’ and can be manually entered one-by-one from various menu trees. We will start from accessing Work items directly from the job pages. Clicking on the ‘Work Items’ menu (which is in the list of tabs on the left hand side of the jobs page) opens another page in which you can view, add, edit, update or delete work items just for that project. To add a Work Item, click on the + button at the top right of the page above. The web page below opens. Every item has to have a job (project) code, a date entered, someone responsible for it, a due date, a work item state, and of course a description. The Work Item ID is autogenerated and cannot be changed. Other fields are not required but can still be useful. In your Quality Assurance check list, for ISO or in-house QA reasons you may have items grouped under headings of some sort. These headings can be maintained in Abtrac by setting up Work Item Groups. As with other lists, the little pencil button to the right of that field lets you maintain the list of Work Item Groups. Similarly some of our clients using Abtrac Work Items use Classifiers. Examples would be to indicate if the item is an engineering, planning or architectural item, or some other classifier commonly used in house. Other fields are also used by various Abtrac users to help them manage the item. In particular the Stage (AKA Task or Phase) field lets you group the items by stage. This is useful because when cloning stages, you can opt to also clone the work items. This is a huge benefit because you only enter the Work Item list once and thereafter simply copy it from one job to the next one of the same type, at the same time as you copy the stages. In addition to tracking the movement of work items using the work item state, people also use the Current Comment field in the work item, along with the work item state. You can type directly into the Current Comment field. We suggest some ‘rules’ around comments, such as preceding the comment with a name and date. The pencil to the right of the Current Comment field lets you enter a whole list of comments as you’ll see. Double clicking on the Current Comment field ‘zooms’ the comment so you can see a lot more than is at first glance on the screen. Once entered and saved, the item can be optionally scheduled to someone to do. This is discussed in another Abtrac Knowledge Base article. When the Work Item is added, you’ll return to the Job Work Items page. Clicking on the hyperlink Work Item number opens that work item. You can also add Work Items from the menu Time & Disbursements >> Work Scheduling >> Planned Work Item. Here we see in the left hand panel each client job that has work items against it and a count of the number of items still ‘of interest’. With the first job being selected we see in the right hand panel the outstanding items for that job i.e. those that are still ‘of interest’. The first item in the right hand panel (Item 11) also has a Due By date showing, indicating this has been assigned to someone with the due by date of 31 August. Clicking on the number 11 will take you to the work item. In your case, if you have no work items entered, you will not see anything in either panel. That is because by default this page shows only ‘items of interest’ and if this is the first time you’ve come into the page, none might have been entered. The ‘Show Zero Items’ tick box is towards the top right of the page. Clicking on it brings up all current jobs whether they have any items against them or not. When Stages (aka Tasks or Phases) are set up for a job, you can copy the stages from another job of the same type by clicking on the second button from the right in the project stages page. 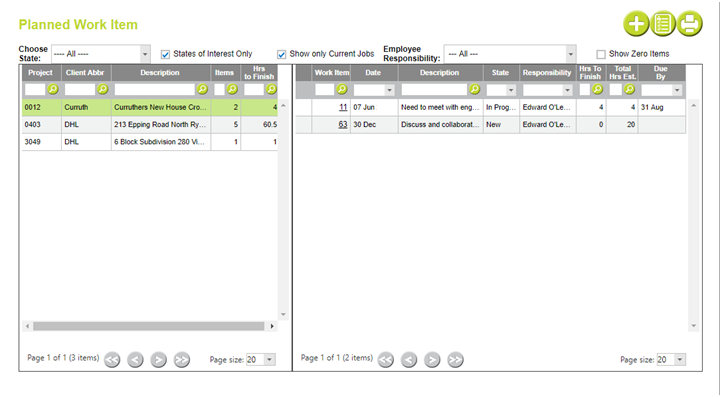 At the same time you can opt to clone the corresponding ‘Planned Work Items’. So once your first job has a suite of Work Items added against it, you can clone the same items along with the stages at the click of the button below. Work items can be used in various ways. The main reason for their use is to avoid having anything that needs to be done ‘slip through the cracks’ and get lost or forgotten or overlooked. Work Items are also a way many Abtrac clients ensure their quality standards are maintained, using work items to standardise how they approach each and every job. The menu Time & Disbursements >> Work Scheduling >> Bulk Manage Items of Interest displays all the items of interest still to be acted on in one list. You can filter by whatever columns are showing, based on the User Control Settings in your configuration of Abtrac. For example click on the magnifying glass to the right of the Due Date and choose the type of filter you want. Then enter the date filter into the cell at the top gives you in this case all items of interest with dues dates <= Jan 31st, 2018. This will show everything due by or before the input date that is still an ‘item of interest’. In the same page above you can take the tick out of the ‘States of Interest Only’ tick box and search on anything in any field e.g. search in the Description filter for anything containing any word or words (or a piece of a word if you’re not sure how it might have been spelt in the first place). Without the ‘States of Interest Only’ tick, all items will show up whether they are still of current interest or long since done and dusted. If you select all items whether they’re of interest or not you could find your browser takes a long time to load thousands of records. So before taking the tick out of ‘States of Interest Only’, make sure you have already applied other filters in some of the columns of the grid so as to reduce the records you want [to wait for] in your query result. Whether you assign the work items to employees or not as discussed in another Knowledgebase article, each work item remains in its own right on a list of things to do, until it is deemed no longer of interest either because it’s completed, cancelled, put on hold or into some other ‘State’ which is set up by the administrators in your instance of Abtrac. This entry was posted in Jobs & Projects, Tips & Tricks, Work Scheduling and tagged job, phases, Planned work, project, Project Stages, stages, tasks, Work Items, Work Scheduling by Sharnee. Bookmark the permalink.